2010 Wall Calendars are Ready! Click Here to See the 2010 Views Infinitum Calendar! In these days of iPhones, Blackberries, Internet portals and computerized reminder services, I still find a wall calendar a very welcome, colorful and useful tool for my office and home. If you feel the same or know of someone who does, check out the 2010 Views Infinitum Wall Calendar. I have selected 12 of my best photos from the blog from a variety of subjects you see here weekly. You can preview the entire calender by clicking on the ad to the left or the link above. 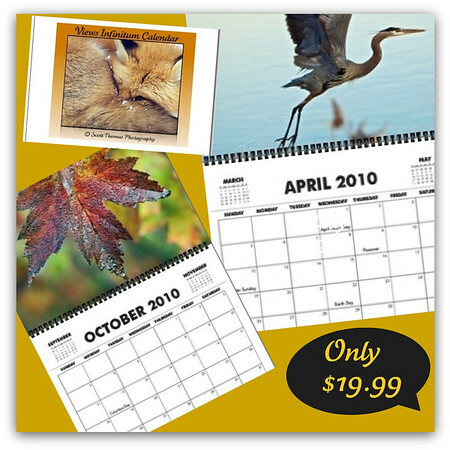 The calendar is printed on durable 100lb. paper stock and measures 11 x 17 inches when hung on a wall or bulletin board. The price is only $19.99 (US currency) plus Shipping. If you have any questions, leave me a comment and I’ll get right back to you. This entry was posted in News and tagged 2010, autumn, calendar, christmas, disney, gifts, leaf, new york, organize, Photography, photos, sunset, syracuse, wall, waterfall, wildlife, zoo. Bookmark the permalink. 6 Responses to 2010 Wall Calendars are Ready! Nice work on the calendar, I have always loved the look of a calendar as well !! Great shots for the 12 months. A beautiful calendar. I like having a wall calendar as well, I like things that “are really there”, if you know what I mean. It’s ironic, but I don’t like computers that much.. I have already bought a calendar for 2010, but maybe I’ll buy one as a christmas present…? BTW, I’m wondering if you will check out the challenge at my blog? What a neat idea, Scott. I was thinking of doing a photo book, myself, but a calendar is more useful.